James Harold Strange (known as Harold) was born between July and September 1894 (most likely 14th August) in York to Henrietta Strange. His father is unknown and died not long after his birth. Henrietta married William Hockett in October 1899. William had also been recently widowed and also had a son. Henrietta was born in St. Lawrence, Yorkshire. In 1901 William Hockett was serving in the 3rd Battalion West Yorkshire Regiment (militia) and the family was living at 62 Alma Terrace, York according to the Census. Henrietta was listed as the head of the house as William was serving in Malta and Harold is recorded as James H S Hockett. Harold Strange was awarded the 1914 Star with clasp (Mons Star), the British War Medal and the Allied Victory Medal. 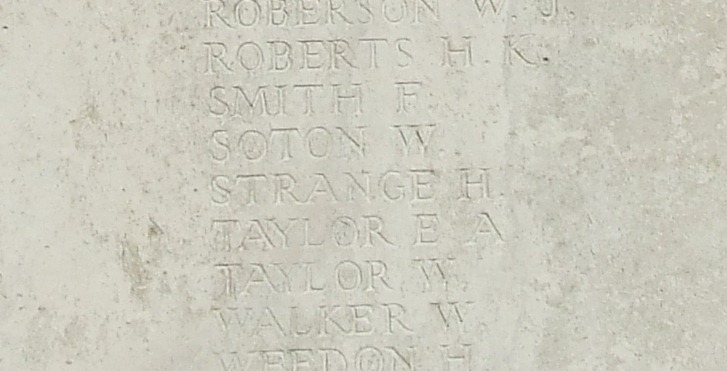 He has no known grave and is commemorated at the La Ferte-Sous-Joarre Memorial, France.